Total catalytic oxidation of isopropyl alcohol (IPA), used in fragrance lamp industry, remains one of the most popular techniques to remove indoor environmental pollutants (Volatile Organic compounds VOC). Many catalysts were already used in such technique. In our study, catalytic oxidation of isopropyl alcohol was investigated on catalysts based on platinum. The influence of two parameters on the catalytic activity was studied: the active phase content and the effect of methyl cellulose on Pt particles dispersion. In this study, mullite (Al6Si2O13) known for its excellent thermal stability and thermal shock resistance, and alumina (α-Al2O3) were used as supports. Pt/α-Al2O3 and Pt/Al6Si2O13 catalysts were prepared using the impregnation method. 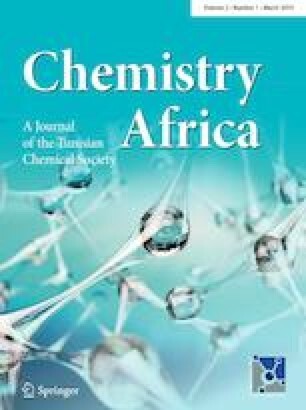 Platinum supported on mullite was synthetized in two different ways, with and without methyl cellulose (MC) in order to study the influence of adding methyl cellulose on the platinum particles dispersion over mullite. Furthermore, the resulting materials were characterized by BET, X-Ray diffraction (XRD), transmission electron microscopy (TEM) and H2-chemisorption to determine the dispersion of platinum particles. All the catalysts were tested in total catalytic oxidation of isopropyl alcohol. This study showed that Pt/Al6Si2O13 synthesized with MC exhibited better activity performance than the one prepared without MC. This can be explained by the fact that the addition of MC enhanced the Pt dispersion over mullite leading to an improvement in the catalytic activity and the selectivity into carbon dioxide. At the end, this study presents scientific findings and many attracted research interest concerning the use of hydrogel based methyl cellulose as a dispersing agent in the synthesis of catalysts. Paper presented at Second International Symposium on Materials, Electrochemistry and Environment (CIMEE 2018), Tripoli, Lebanon, 18–20 October 2018. Isopropyl alcohol (IPA) is commonly used as solvent and reactant in the chemical industries. IPA is also used in fragrance lamp as a highly flammable liquid. Its total catalytic oxidation into CO2 and H2O is one of the most popular technique to treat harmful Volatile organic compounds (VOCs) considered as the first source of indoor environmental pollutants both in living and working place [1, 2]. IPA is as well used as a carrier for the fragrance knowing that it has a vapor pressure of 42.74 mmHg at 25 °C. In fact, it is used as major component in alcohol-fragrance mixture deployed in fragrance lamp which is composed of 90% IPA and 10% fragrance. The obtained mixture placed in the fragrance lamp reservoir is transported up along a wick by capillary action from the reservoir to a flameless catalytic burner where alcohol combustion as well as fragrance dispersion in the atmosphere will take place. The catalytic oxidation of IPA can be carried out at temperatures 300–500 °C lower than that for thermal oxidation . Precious metals, such as Pt, Pd, Rh and Au are the most commonly used metals in the environmental industry [4, 5, 6, 7, 8]. Among precious metals, Rhodium offered the best performance since it has a very good catalytic activity in IPA oxidation but it is the most expensive of all precious metals. Also, Palladium supported catalyst provided good performance but does not destroy all molecules present in the air such as aromatic compounds. Therefore, Platinum offered good performance and is the best compromise in between. Due to oxygen deficiency, it is important to note that increasing the metal particles dispersion may help in the increasing of the oxygen mobility and therefore the catalyst efficiency and selectivity. Furthermore, that the catalytic activity, stability and selectivity of the metal-based oxides were found to be majorly dependent on various factors such as, metal particle size and dispersion, preparation methods, calcinations temperature, type of support and the pretreatment procedure . By manipulating these factors, beneficial results are ought to be obtained for the fragrance lamp industry. Therefore, by simply increasing the metal particles dispersion, the amount of the metallic phase on the surface as well as the catalyst cost may be reduced. Thus leading to an increase in the catalyst efficiency and selectivity. Metal particles dispersion was enhanced by the addition of glycerol into the catalyst preparation as shown in a study by Nguyen and al . Moreover, it has been reported that Methyl cellulose (MC) has an excellent film and emulsion forming ability with metal ions and metal oxides that made him a good candidate to be used as dispersing agent [11, 12, 13]. In the other hand, mullite denoted 3Al2O3·2SiO2 or Al6Si2O13 is an aluminosilicate known for various properties that make it suitable for its usage in the fragrance lamp industry. These properties include good resistance to thermal shock, resistance to abrasion and extraordinary corrosion resistance to most chemicals [14, 15, 16, 17, 18, 19]. Some studies also reported that a mullite catalyst has a remarkable catalytic performance towards NO oxidation as shown by Wang and al. . As far as we know, no studies have been reported that deal with IPA catalytic oxidation over platinum supported on mullite knowing that Wang et al. had the platinum replaced by Mn-mullite in the diesel soot catalytic oxidation . As for alumina, it is the most commonly used support. Thus, the aim of the present work is to investigate the effect of (1) Platinum content on total oxidation of isopropyl alcohol, and (2) to study the effect of adding MC onto the impregnation procedure in order to optimize Pt particles dispersion over mullite with a low surface area. Pt supported on alumina was prepared by the conventional wet impregnation method using alumina SCS9 (α) Rhône-Poulain (purity 99.9%; surface area = 8 m2 g−1) conditioned in the form of spherical beads of 4 mm diameter and tetraammine platinum (II) chloride (NH3)4PtCl2·H2O (Sigma Aldrich, purity 98%) dissolved in water. The slurry was stirred for 1 h at 60 °C, in a rotary evaporator. Water was then removed under reduced pressure and the obtained solid was dried for about 24 h in an oven at 100 °C. After drying at 100 °C, the catalyst was calcined at 500 °C under N2 for 30 min then reduced under H2 for 2 h and treated under N2 for 30 min at a flow rate of 2L/h. The solids are denoted Ptx/Al in which x represents the Pt content (x = 0.3, 0.6 and 1 wt%). In the second part, Pt species were also impregnated in the same way on mullite support for comparison purposes, with Pt content of 0.6 wt% (optimal concentration) with and without MC. During the preparation of the catalyst based on platinum supported on mullite with MC, pure methyl cellulose from Sigma Aldrich (purity 31.5%) was used as an additive to form a hydrogel. Following the same procedure, the adequate amount of MC and tetrammine platinum (II) chloride was mixed in water to give the desired MC and Pt loading (2.1 wt% and 6.4 wt%, respectively). The formed gel was used as a precursor to obtain the new catalyst designated as Pt0.6/MMC. The catalyst prepared without MC was denoted Pt0.6/M. The mullite used in our study was supplied by Tritrust industrial Co (China) with a surface area of 12 m2/g. Chemical composition of the solids was determined by inductively coupled plasma atomic emission spectroscopy, ICP-AES. The specific surface areas were measured by the BET method on a laboratory made apparatus after outgassing at 300°C for 2 h under vaccum (10−2 Pa). The phase identification and study of the structure were performed by X-ray diffraction. X-ray diffractograms were recorded in air at room temperature with a SIEMENS D500 diffractometer using CuKα1 radiation (λ = 15,406 Å Ni filtered). Diffraction data were recovered from 3° to 80° in 2θ angles with a step of 0.02°. Data were compared to the JCPDS files. The morphology of the prepared solids was examined by TEM performed at room temperature on a JEOL 100 CX. Prior to TEM observations, samples were deposited from ethanolic solution onto holey-carbon copper grids. Particles dispersion was determined by H2 Chemisorption after reducing the catalyst in pure hydrogen flow for 2 h at 300 °C. The quantitative determination of chemisorbed hydrogen by temperature programmed desorption (TPD) was used as a standard method to characterize the dispersion state of supported platinum. Before carrying out the chemisorption, the sample (approximately 400 mg) was treated under air at 300 °C for 1 h and then reduced in a dilute hydrogen solution in argon (1% vol H2, Ar) from 25 °C to 300 °C (10 °C min−1) with a stand-by at 300 °C for 2 h. In order to remove all traces of hydrogen, the sample was purged under argon at 300 °C for 1 h and then cooled under an argon flow to ambient temperature at which the chemisorptions of hydrogen was performed. The measurement was carried out by passing a series of hydrogen pulses (5) onto the sample at a regular interval of time. This non-adsorbed amount is null at the beginning because all the hydrogen is adsorbed and then it increases with the pulses until becoming constant (saturation). The difference between the amount of unadsorbed gas and the amount of hydrogen sent will give the amount of gas adsorbed for each pulse. In order to measure the H2 content in argon, a microcatharometer connected with a signal amplifier was used. The amount of unadsorbed gas was detected by the apparatus. Catalytic activity tests were performed on 20 mg of catalyst, placed in a U-type reactor, by using a mixture consisting of IPA (5 vol%) and air (95 vol%) with a total flow rate of 30 cm3 min−1 and conducted under atmospheric pressure. The reaction was carried out under a flow of gas through a saturator containing isopropanol placed in a Dewar flask maintaining the temperature at 20 °C. IPA inlet and outlet concentrations were analyzed using a Chromatopac Shimadzu Gas Chromatograph equipped with a flame ionization detector connected to a PoraBOND Q column. Carbon dioxide was analyzed by a thermal conductivity detector connected to a Porapak Q column. The operation conditions of the pretreatment and activity test were the following: The solid undergoes a pretreatment consisted of a heating ramp to 300 °C at a rate of 5 °C/min, a stand-by at 300 °C for 1 h under H2 and N2 and a cooling down to 100 °C. Then a stand-by at 100 °C for 1 h, a heating ramp from 100 to 200 °C, a stand-by at 200 °C for 1 h, a heating ramp from 200 to 300 °C, a stand-by at 300 °C for 1 h, a heating ramp from 300 to 400 °C, a stand-by at 400 °C for 1 h, a heating ramp from 400 to 500 °C, a stand-by at 500 °C for 1 h and a cooling down to 100 °C. In order to evaluate the performance we evaluated the IPA conversion and the selectivity into CO2. where [IPA]in and [IPA]out denoted the inlet and outlet concentrations of IPA, respectively. Catalysts characteristic results for various amounts of platinum supported on α-Al2O3 are shown in Table 1. ICP-AES chemical analysis results confirmed the composition corresponding to the different catalysts. The BET surface area obtained was 8 m2/g for all the catalysts. It seems that the increase in the platinum content has no influence on the specific surface area of alumina. Platinum dispersions obtained by H2 chemisorption method were 28, 56 and 87% for Pt0.3/Al, Pt0.6/Al and Pt1/Al respectively. The reason that by increasing the metal content, the Pt dispersion increase without affecting the specific surface area could be related to the interaction between platinum and alumina sites reported previously by Pesant et al. . It seems that increasing Pt metal amount from 0.3 to 1 wt% on α-alumina leads to an increase in the availability of active sites without a considerable change in particles size due to a high interaction between Pt–Al and therefore an increase in Pt dispersion. Such explanation could be taken into consideration only for low Pt metal amount less than 1 wt%. A similar result were obtained by Lee and al, they reported that for 1 wt% Pt/Al2O3, the number of specific sites on alumina was sufficient to disperse platinum particles but for high Pt loadings (10 wt%), the number of platinum atoms are greater than that of specific sites on alumina therefore the addition of high Pt amount leads to an agglomeration . Platinum shows higher dispersion with increasing number of sites to a certain optimal Pt amount and interaction strength due to the interaction between Pt atoms and specific sites on alumina . The results of the XRD patterns are shown in Fig. 1. The XRD pattern for the different catalysts presents the diffraction peaks marked by (•) which revealed a well crystallized phase for α-Al2O3 (JCPDS card No. 10-0173). X-ray diffraction for Pt0.6/Al catalyst also revealed a well crystallized phase with the presence of reduced Pt represented by (*) as revealed by diffraction peaks at 2θ = 39.7° and 46.2° which correspond to reflections from (111) and (200) planes respectively (JCPDS 65-2868) [23, 24, 25, 26, 27]. The TEM images represented in Fig. 2 clearly show the size of platinum particles dispersed on the α-Alumina. It is noticed that on Pt/Al catalysts, the average particle size was between 1 and 2 nm depending on the Pt weight percentage with the presence of few other particles with a diameter around 50 nm on all the catalysts based on Pt deposited on alumina. The presence of such big particles can be due to the α-alumina low specific surface area. These particles with a diameter of 50 nm could be the one detected by XRD since it is difficult to detect small platinum particles by X-ray diffraction [28, 29, 30, 31]. In order to evaluate the performance of the catalysts in IPA oxidation, the IPA Conversion as a function of temperature over Pt supported on alumina and the selectivity into CO2 are shown in the following diagrams (Fig. 3). The oxidation of isopropyl alcohol starts at 100 °C on the different catalysts. Between the Ptx/Al catalysts, Pt0.3/Al was the less efficient. Furthermore, the Pt0.6/Al solid showed a high catalytic activity and selectivity into CO2 similar to Pt1/Al catalyst, which means that a 0.6 wt% of platinum can be used as an optimal concentration. Such activity can be attributed to a high dispersion of platinum on alumina. Therefore 0.6 wt% was chosen as an optimal concentration in the upcoming study of the effect of the support nature on the catalytic activity. Catalysts characteristic results for Pt0.6/Al, Pt0.6/M and Pt0.6/MMC are shown in Table 2. ICP-AES chemical analysis results confirmed the composition corresponding to the different catalysts. The BET surface area was 6 m2/g for the Pt0.6/MMC and Pt0.6/M. Platinum particles dispersion obtained by H2 chemisorption method were 36% and 22%, respectively. Thus MC addition enhanced Pt dispersion. In addition, we noticed that the specific surface area of Pt/Al6Si2O13 did not change whether with or without MC. This could be explained based on the study done by Xiao-Yuan Dai and al  in which the cellulose content seemed to have minimal effects on the pore size distribution. The XRD patterns (Fig. 4) show that the mullite solid presents the diffraction peaks which revealed a well crystallized phase (JCPDS No.15-0776) with a space group Pbam . X-ray diffraction for Pt0.6/M catalyst also revealed a well crystallized phase with the presence of reduced Pt. Same result was obtained for Pt0.6/MMC (Figure not shown). Representative TEM images of the different catalysts supported on mullite are represented in Fig. 5. The platinum particles were heterogeneously dispersed on the support surface (Fig. 5). TEM images clearly show the size of platinum particles. For Pt0.6/M, the Pt particles size were around 5 nm with a presence of some particles with a size around 10–48 nm (Fig. 5a and b). 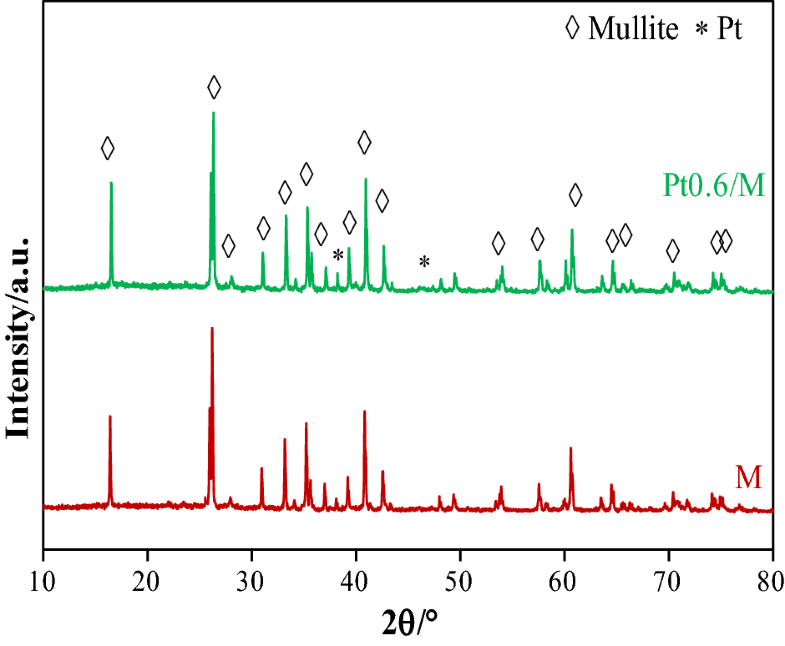 However, it should be noticed that Pt were not well dispersed on mullite compared to alumina support (Fig. 2b) with the presence of area free of platinum in agreement with H2 chemisorption results. For Pt0.6/MMC (Fig. 5c–e), TEM images shows Pt particles size between 1 and 5 nm with a dispersion average of 36% instead of 22% for the catalyst without MC. Also, we noticed the presence of some particles with a diameter between 10 and 20 nm. These results show that the addition of MC inhibits the agglomeration of metal precursor during the synthesis and thus enhance the Pt dispersion on mullite. IPA conversion and CO2 selectivity on Pt0.6/M and Pt0.6/MMC are illustrated in Fig. 6 and are compared with Pt0.6/Al. The Pt0.6/MMC catalyst showed better activity performance and selectivity into CO2 than the one prepared without MC. This increase in the catalytic performance is related to the higher dispersion of platinum on the mullite by adding MC. 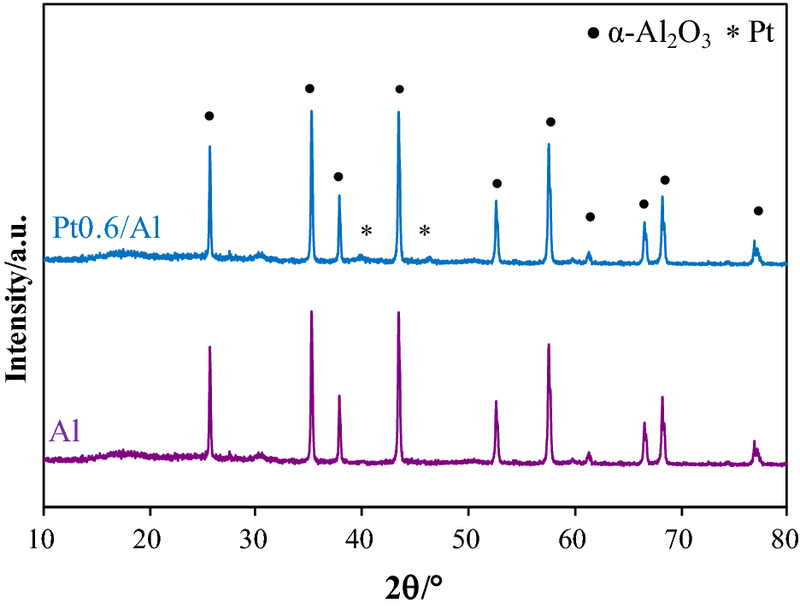 The high dispersion observed on α-Al2O3 can be attributed to a peculiar interaction between the alumina and platinum precursor . It seems that platinum particles were localized on specific area (Aluminum zone) and Pt exhibit better dispersion on aluminum sites than silica sites. This can be due to an interaction between Pt–Al. The weak interaction between silica sites and the platinum were also reported in previous studies by Pesant et al. .
To explain these results, during the impregnation process of the supported metal, MC seems to be the dispersing agent leading to the inhibition of the agglomeration of active component, the control of the particle distribution and size as well as the influence of the surface morphology [11, 12, 13]. MC played an important role in increasing the viscosity. Consequently, it inhibited both the redistribution of the Pt particles and the migration of impregnation solutions, during the drying process, towards the support’s external edge. As a consequence, MC is a major contributor to the uniform distribution and high dispersion of the active phase over the support while avoiding the agglomeration of the metal precursor . This study demonstrated that methyl cellulose have many attracted research interest and might be used as a great dispersing agent in many applications such as fragrance lamp industries. The oxidation of isopropyl alcohol (IPA) on different catalysts has been studied. Platinum catalysts were deposited on α-Al2O3 and Al6Si2O13. Between the different catalysts, Pt0.6/Al and Pt0.6/MMC showed a much higher IPA conversion and selectivity into CO2 than Pt0.6/M prepared without methyl cellulose (MC). This was attributed to a high dispersion of platinum particles on the supports. This study explains the effect of adding methyl cellulose to the catalyst synthesis method in order to improve the Pt dispersion that leads to a better catalyst performance. The authors sincerely acknowledge the Claude Bernard University Lyon I (France) for performing the TEM images and the ICP-AES analysis.